4.5 stars. I loved this book. When I originally started listening to it (in the first 5 minutes to be fair) I wasn't sure if I would like it. So I put it down. A few weeks later, I decided it was time to tackle it again and I am so glad I did. This book had a similar feeling to John Boyne's The Heart's Invisible Furies which was one of my favorite novels of the last five years. But it was lighter and a faster read. This is the story of Maurice Hannigan who is now old and sitting at the bar of a hotel and telling the story of his life through five specific toasts he makes. He recounts some of his saddest moments and some of his happiest and the people whose lives had a profound impact on the choices he's made in his life and the impact his choices have had on others' lives. There is so much gold in this book. So much introspection. So much perspective. It's kind, deep, honest and true. It shows how all humans suffer and how all humans are flawed and how the experiences we have impact so many of the choices we make in life. It made me think a lot about the consequences of the reactive decisions we make in life. It made me think about my own life and all the places where I made choices which were to "get back at" or respond to a life event at the time of my childhood. All the stories I am still holding inside myself. It made me realize that others' likely have their own stories of those same moments and what life was like for them. It made me think deep and wide and revisit so much of my own life. And if that's not a fantastic book, I don't know what is. 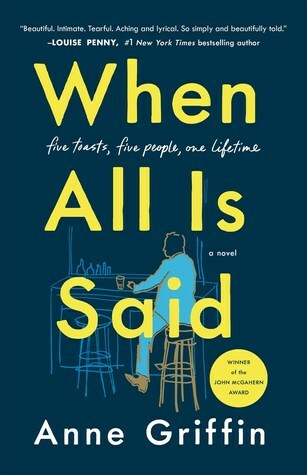 Sign into Goodreads to see if any of your friends have read When All Is Said.